I spent much of yesterday in the car driving to Gatwick airport to drop our son Ben off on the next stage of his world travels. He has recently returned from Central America and is now going to Norway for the summer before heading off to Japan in the autumn. It makes our travel sound a bit mundane. We spent yesterday evening with our neighbours Roger and Caroline from across the lane and Alan and Val from next door. It was a fun evening and a great chance to catch up. 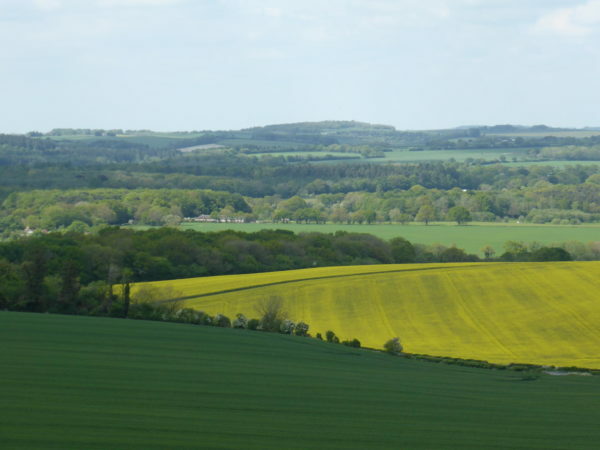 On Tuesday when walking in Bentley Wood I commented to Lynnie that I had never walked from Pitton to Pepperbox Hill. 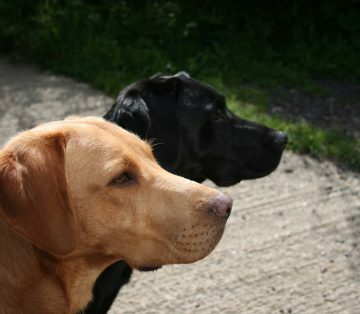 The sun is shining it’s a cracking afternoon so boots on, sandwiches packed, dogs to heel and I set off. Lynnie has declined the offer of a good long walk. Leaving Whitehill Farm I head to Farley, through Church Copse and follow the track down to the village. At the road I turn right and soon see the familiar site of Farley Hospital on my left and Farley Church on my right. I played most of my cricket for Farley and spent many hours looking at these two fantastic buildings. There cannot be many better spots to play cricket. 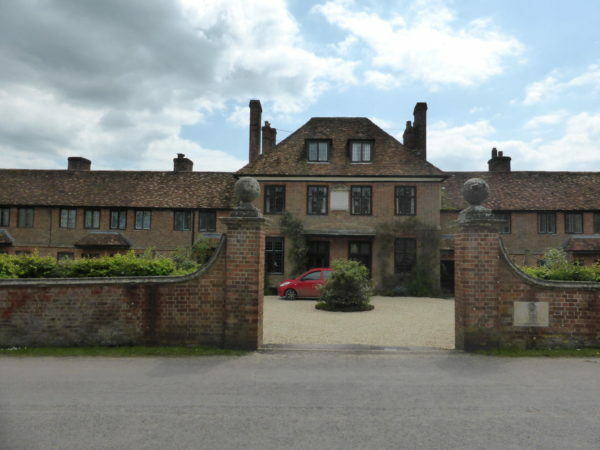 Farley Hospital was built in 1681 and financed by Sir Stephen Fox, he had recently returned from France with Charles II. Sir Stephen was born in Farley and wanted to do something for the community, so he built the twelve almshouses with the Wardenry in the middle. Alexander Fort, Sir Christopher Wren’s master stonemason oversaw the building. Opposite the Hospital is All Saints Church another fine building. 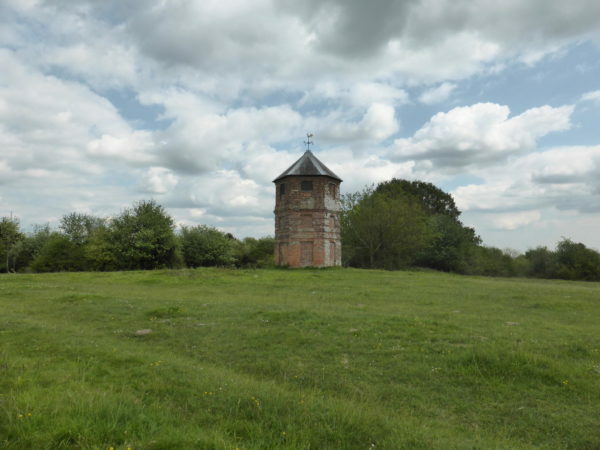 Also funded in the main by Sir Stephen Fox and built by Alexander Fort. Fox and Wren worked together to build the Chelsea Hospital for pensioners and there is an assumption that Wren had a strong influence on the design of All Saints Church. Striding on I take the footpath on the left and walk up through the field to the Hook and Glove car park, the landlady Fiona is busy watering the garden, it is too early for me to partake. I promise to pop in on the way back in about four hours time. Taking the footpath opposite the Hook I wander through Farley Copse, Grassy Common, and Brown’s Copse to join the road and turn right towards East Grimstead. At the junction I turn left and walk through the village, we pass the home of Annie, she bred Dexter and Crosby, and carry on until we reach the church. 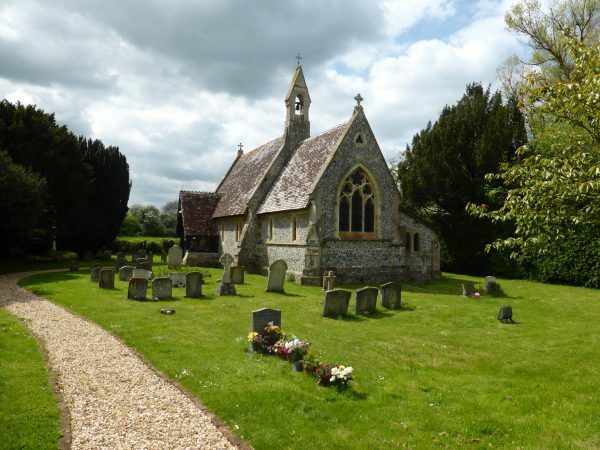 Holy Trinity Church was totally rebuilt in the 1850’s, it is a small attractive church that seats about fifty people. The church wall has been rebuilt more recently, around 1980 my mucker Willy failed to negotiate the sharp bend by the church and ploughed through the wall. Fortunately he was okay, the wall slightly less so. I take the drove opposite and soon cross the route of the old Salisbury to Southampton Canal. The canal opened in 1802 but had a short life closing in 1806. There were problems with the construction, a lack of funding to complete the project and some wilful damage resulting in early closure. 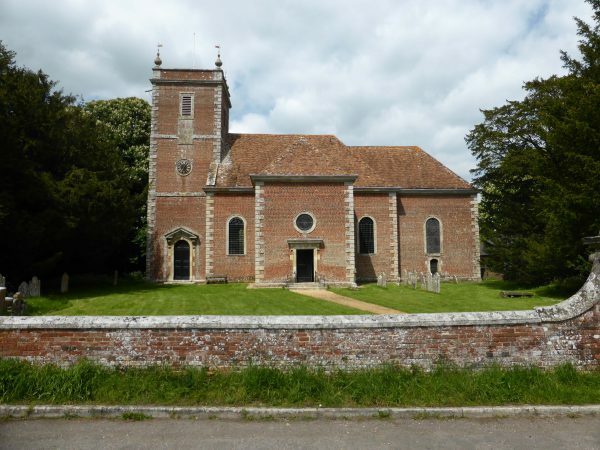 At one time there were three locks at East Grimstead and two further down at West Dean. At the junction with the road I turn right and cross the road to take the right fork on the track opposite. 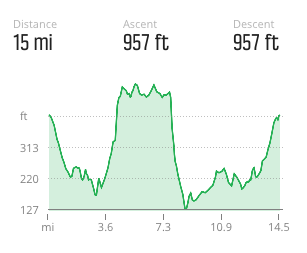 This steady climb takes me up to Pepperbox Hill which houses the Pepperbox and I then walk along the ridge. It is years since I have been up here and the views are truly stunning. I stop and look back over the valley below, with fine views of Salisbury Cathedral and to my right across the areas that I walk regularly. 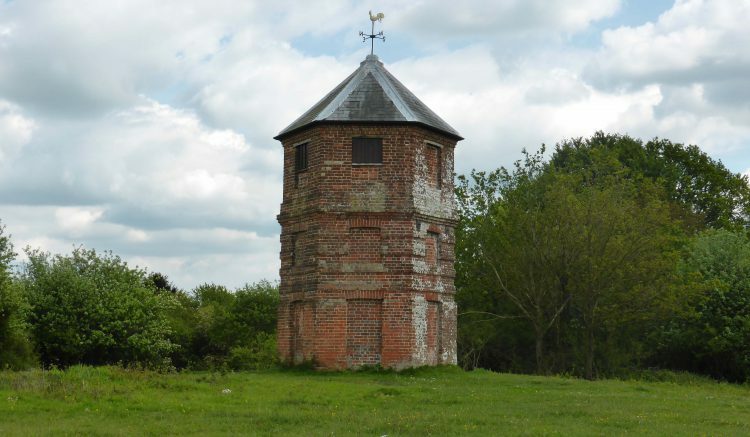 I then make my way to the Pepperbox, a brick folly built by Giles Eyre of Brickworth House, it may have served as a viewpoint for ladies following the hunt and a haunt for highwaymen. It also served as a lookout for the Home Guard. As a child Pepperbox was always a favourite location for a birthday party. I have memories of being up here one summer with the Judd’s and our good friends from Yorkshire the Wilkinson’s (known as the Wilk’s). Dad recounts that all three families and several other local children had loaded into three estate cars, or as Dad described them shooting brakes. As the term suggests shooting brakes originated in the 19th century to describe a vehicle used to transport shooting parties. It was then used to describe station wagons and other estate type vehicles. After another stop to admire the views I turn around and retrace my steps along the ridge, ignoring the track that led me up I continue along Dean Hill until I reach the road and then turn left to descend down hill before joining the footpath that skirts Royal Navel Armaments Depot Dean Hill, Dean Camp. In 1938 the Ministry of Defence requisitioned 500 acres of Dean Hill farmland to build a heavy weapons store for the Royal Navy based at Portsmouth. The depot was opened in 1941 and was linked to the naval base by the railway. The storage facilities are huge bunkers carved into the chalk of Dean Hill and over time are reported to have housed more sophisticated weapons, (whatever that might mean). My paternal grandfather, known by many as “Chinky” due to his habit of chinking the coins in his pocket, was born in 1884, he was a dock worker and boiler stoker. He was also a traveller, he lived in New York from 1912 to 1920, it must be his travelling genes that Ben has inherited. In 1941 he came to Dean Camp to work as a boiler stoker, working there until his retirement well into his seventies. Initially he lived in a converted railway carriage in a siding on the camp. He then lived in a shepherds hut on a farm opposite the Old Brewers pub until the early 1960’s. Life must have been very basic, nothing like the luxury of the Unicorn. Having followed the path around the camp I enter West Dean village, stopping briefly on the green. When I was young I recall Dad taking part in a tug-of-war competition, he was part of the Pitton village team. The prize for the winners was a barrel of beer and this was strategically placed on a platform in the river in front of the pub. The opposing teams on either bank, with the winners remaining dry and the losers wet. West Dean is now a “dry” village, the Red Lion pub having closed a number of years ago. It was renowned locally as the Hampshire and Wiltshire border ran through the pub. It was a regular stop off point on the return journey from away cricket matches, many happy hours were spent in there. I resume my walk, crossing the river and following the road left over the railway line and on towards the third church of my walk. 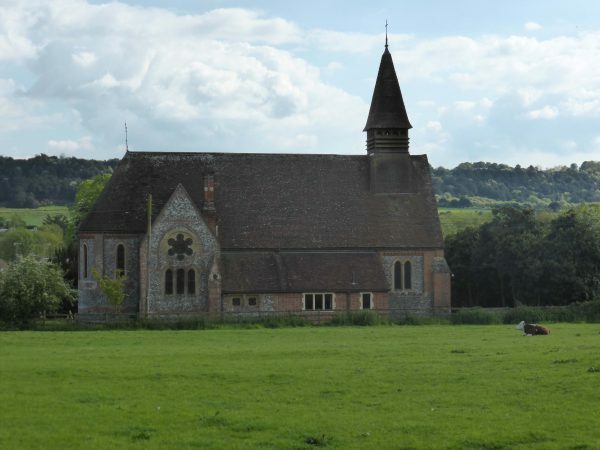 The Bishop of Salisbury consecrated West Dean’s church, St Mary the Virgin, in 1866. It was built to accommodate 194 people, 144 adults and 50 children. An impressive number given that in the 1920’s the population of the parish was 402. I leave the village via Dean Road heading towards West Tytherley, forking left when I reach the South Lodge of the Norman Court Estate. Another half a mile and I turn left into Bentley Wood taking the track that Lynnie and I had used a few days earlier, passing Howe Cottage, Howe Farm and Keepers Cottage. I stay on the track until I reach the road and walk straight across into Ben Lane. On the right of Ben Lane is Blackmoor Copse, another area I have never walked so I make a mental note to wander here the next time we are in the area. At the end of Ben Lane I turn left to the Hook and Glove. Having enjoyed a couple of pints of Ruddles Best and some good banter with a couple of locals I retrace my earlier route back to the Unicorn. 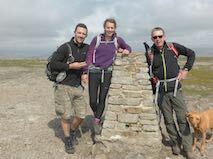 It has been another cracking afternoons walking, covering just over fifteen miles in warm sunny conditions.